A digital multimeter is most sought after instrument if you are planning to start your own home solar power project. It is the most useful and multipurpose instrument which can really be boon for you, provided it is from a reputed company and has a good model. In fact the multi meter has three devices which are built in one instrument. It has voltmeter to measure the electric current in volts, the ammeter measures the amount of the current and digital multimeter measures the electric resistance of the device. Electric resistances is measured in terms of ohms, the modern good quality multimeter are designed in such way that can be easily operated. 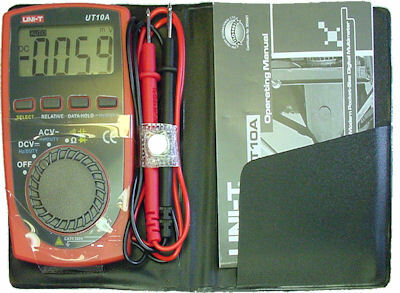 The good quality multimeter has a plastic case and has easy to use selector knobs with a screen on the top part which shows the digital reading. Before purchasing a multimeter, some precautions are absolutely must; you should look for a large screen, quite big, so that you can see the readings easily in the sunlight. Most the times when these multimeters are used in sunlight, the reading is not clear. Below the screen is a large knob called the function switch, this switch will help you to select different modes of the operation. With this switch you can easily shift between voltmeter and ohmmeter with the turning of the dial, this is the reason; you should look for the large switch, which is easy to operate. The function switch have normally eight positions, with the V marking which are normally three in umber are used to measure the voltage. Both measurements can be done i.e. AC/DC; you can obtain the measurements in miilivolt range. There are two more markings A~ and A=, A~ measures AC current and A= measures DC current both in amps. The marking which is of horse shoe upside down Ω measures resistances in ohms, if you have to measure voltage, the digital multimeter has to be turned on, it will again go to startup procedure. Normally when the digital readouts light up, the device goes through the self-diagnostic mode, after this it is ready to be used for various functions. The function switch V= is to measure the DC volts, the black and red leads when connected to multimeter at the right places can start the function. Simply connect the red lead at the point marked as VΩ and black lead at the point marked as COM. To measure amps, the leads need to be connected differently by setting the function on switch A= position and connect the black lead to COM terminal. Red lead has to be connected to the terminal marked as 300mA, now your device is ready for different functions. The result you will get in milliamps as you are connected to 300mA terminal. The third functions of the device is its ability to measure in ohms, it is the measurement of the resistance in an electric circuit. It must be remembered to disconnect your multimeter after you use it, and should be safely stored in your tool box. You must also keep it safe that the battery does not get drained, it is such a wonderful device and you must ensure it is properly handled. There are many good brands of multimeter available in the market, choose the best one. For more tips and suggestion on how build your own DIY Photovoltaic (PV) panel on a small budget, check out the Power4Home guide by John Russel. Read up on the Power4Home reviews on this blog for more information.